was what I was looking for on this cold Saturday along the Lehigh Line. My travels took me to Pattenburg (NJ) where NS 214 came through around 8:40. Power was BNSF 4667 (C44-9W), primer painted NS 7566 (ES40DC) and NS 7107 (GP60). It was unusual to see stacked empty truck trailers used for carrying containers in 214's consist. I can't recall seeing that before. At 9:30, NS 21M, lead by NS 9380 (C40-9W) and two other units would head west past MP 68. Driving back east along I-78, NS 11J was heard calling signals at CP 64 around 9:50. At 11:15, NS 213, power unknown, would take the passing siding at Flemington Jct to hold for four eastbounds. The first eastbounder was NS 18G. Power would be NS 7602 (ES40DC) and NS 9952 (C40-9W). 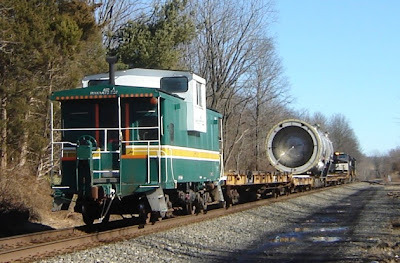 As 18G passed through Stanton Station, it would inform 213 that it would have to wait until the heat exchanger passed that they would continue their westward trip. Twenty minutes later, NS's ethanol train 64J would pass by with NS 2567 (SD70, ex-CR 2567) and NS 9261 (C40-9W) in command. At high noon, the third train, a intermodal whose symbol was unknown, passed. Motive power was two C40-8Ws, PRR 8324 (ex-CR 6068) and NS 8351 (ex-CR 6112). Drove down to Three Bridges where I finally caught the heat exchanger, its width fourteen feet and five inches, heading east at 2:10. Two NS units provided the power. Didn't get the lead unit's number but the second unit was NS 9550 (C40-9W). Had to feel some pity for 213's crew as they would wait for nearly four hours before the heat exchanger would finally pass. A NJ transit commuter train carrying 100 passengers derailed at Ridgewood Junction during the morning rush hour Wednesday, 2/21/07. Three of five cars left the tracks. No passengers or crew were injured. The train was going about 36 mph at the time. Ridgewood Junction is where the Main and Bergen County lines converge. As a result of the derailment there were significant delays throughout the day on the Main, Bergen County, and Port Jervis lines. Service was nearly back to normal by late in the evening. 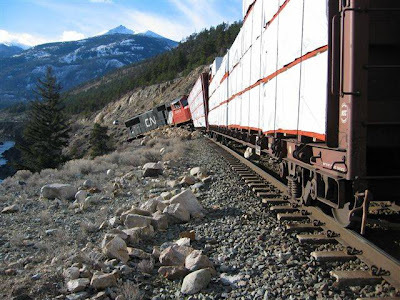 Cause of the derailment? An improperly installed switch. The rails were too close together. 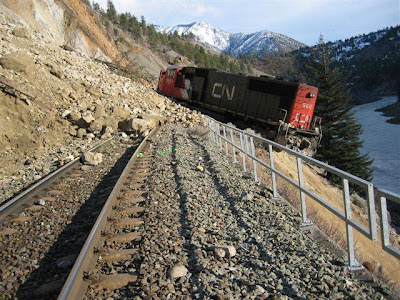 "The rails are supposed to be 58 1/2 [sic] inches apart but were separated by only 54 1/2 inches." (Bloggers note: I thought rails were supposed to be 56 1/2 inches apart.) The switch had been replaced 10 days earlier, and hundreds of trains had passed through Ridgewood Junction since that time without incident. Three employees that were involved in the switch replacement and inspection were suspended - a track supervisor and two track foremen. They face administrative hearings. 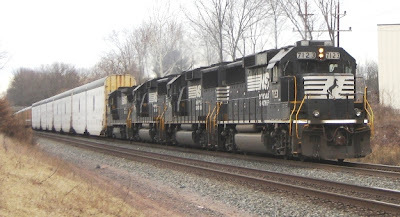 HILLSBOROUGH -- The Township Committee has taken a step toward establishing railroad quiet zones along the Norfolk Southern rail line after approving a notice of intent to the Federal Railroad Administration. Quiet zones are a section of a rail line that contains one or more public crossings, where locomotive horns will not be routinely sounded. Under federal law, locomotives are required to sound their horns when approaching crossings. 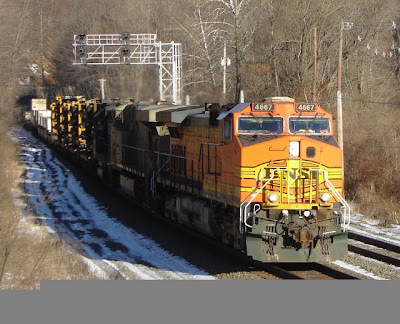 The notice to the federal government states that safety improvements are necessary for quiet zones to be established at four crossings along the Norfolk Southern Railroad at Beekman Lane, Auten Road, Valley Road and Roycefield Road. The crossings are within a few miles of each other. The township appropriated $300,000 for the project after receiving $250,000 from developer Beazer Homes and using $50,000 from last year's capital budget. However, Maurice Rached, an engineer for Maser Consulting and the township's traffic engineer, said construction costs for the improvements will be less than originally anticipated. Original cost estimates ranged $350,000 to $450,000 and now the full costs will be about $300,000, Rached said during Tuesday's Township Committee meeting. The project calls for more security devices to be installed so the zones may be approved by the Federal Railroad Administration, Rached said. The purpose of the notice is to provide an opportunity for railroads and state agencies to offer comments and recommendations to the township zone, he said. 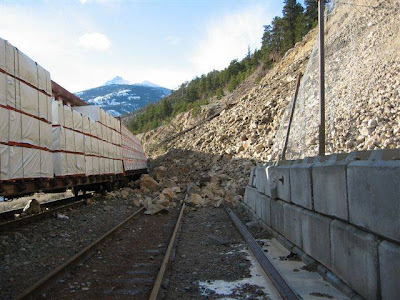 Federal regulations require the notice must be filed with the Federal Railroad Administration in Washington, D.C.; the state Department of Transportation Rail Safety Division; and with the Norfolk Southern Corporation in Roanoke, Va., said Clerk and Business Administrator Kevin Davis. Beekman Lane: Construction of 4-foot wide, 100-foot long, raised islands at both approaches to the crossing; additional signage and pavement striping. Installation of a "power-out" indicator. Auten Road: Construction of 4-foot wide, 100-foot long, raised islands at both approaches to the crossing; additional signage and pavement striping. Installation of a "power-out" indicator. Valley Road: Construction of two new gates, which will cross the entire roadway, curbing at the edges of the roadway to prohibit vehicles from traversing around the gate. A wayside horn will be installed for each vehicular approach. Installation of a "power-out" indicator. Roycefield Road: Construction of 4-foot wide, 100-foot long, raised islands at both approaches to the crossing; additional signage and pavement striping. Installation of a "power-out" indicator. Saturday morning's sightings along the Lehigh Line started out at Flemington (NJ) Junction (CP 51) with NS 20K coming through around 8 AM. Power was two C40-9Ws, NS 9779 and NS 9129. Once 20K was clear, NS 212 would come off the siding and head east. Motive power for 212 would be three GP60s, NS 7123, NS 7116, NS 7119, along with B32-8 NS 3559. Next it was down to Manville where NS 21M was running a little later than usual. 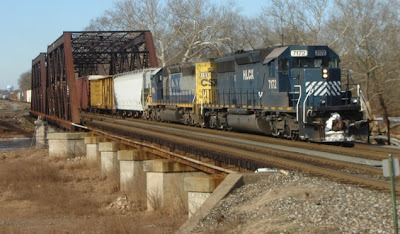 NS 9332 (C40-9W), NS 9130 (C40-9W) and NS 2775 (SD70M-2) would bring 21M through Manville around 9:10. CSX's Q300 would then head east with HLCX 7172 (SD40-2, ex BN 7172) and CSX 8196 (SD40-2) for power. At 10 o'clock, CSX S439-10 would bring its train of mixed freight down the Trenton Line. CSX 8773 (SD60M, ex-CR 5543) and CSX 8744 (SD60I, ex-CR 5631)was the power. NS 24V would finally roll through with two C40-9Ws, NS 9233 and NS 9399, for power around 11 o'clock. It would have a rolling meet with a westbound NS train with three C40-9Ws, NS 8991, NS 9024 and NS 9754, for power. I will speculate this train's symbol might have been NS 213 with some autoracks and TOFCs. Scheduled to roll down the Lehigh Line but not seen until later was NS 24V and NS 18G. They would come through Neshanic around 11:45. Power was not seen. The final power tally would be nine C40-9Ws, two SD60s, two SD40-2s, three GP60s, one B32-8 and one SD70M-2. All in all, not a bad day to be trackside. SOUTH PLAINFIELD - A freight train veered onto the wrong tracks Wednesday evening, striking a piece of equipment and coming to a stop inside the building of a paint manufacturer. According to John Enright, a spokesman with Conrail, the train was traveling southeast on its way to Woodbridge at about 7:30 p.m. when an open rail switch sent it onto a side track. The train, which was carrying more than 70 cars of ethanol, then struck a piece of rail equipment on the track and entered the building of Whittaker, Clark & Daniels Inc.
Enright said two locomotives, a buffer car and two of the tanker cars followed the rails into the building. 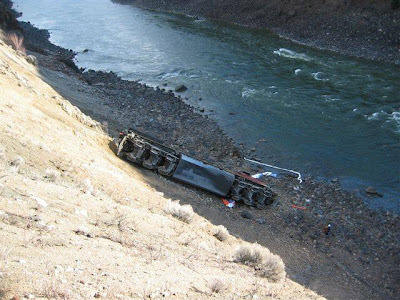 At no time did the train derail, he said, and none of the tanker cars spilled open. No injuries were reported and no evacuations were necessary, Enright said. Enright said Conrail officials were still investigating why the switch was open. He said it was unclear if the error was human or if it was related to the weather or the movement of the train. The area of the derailment sits right off Interstate 287, near Talmadge Road, in the southern part of the borough. The Web site for Whittaker, Clark & Daniels Inc. describes the company as a manufacturer of colors, minerals and pigments for paint. Washington, D.C. - National Transportation Safety Board Chairman Mark V. Rosenker today asked Congress to give the Federal Railroad Administration the statutory authority to revise hours of service rules for railroad workers, noting that current rules are not based on science related to fatigue. Testifying before the Subcommittee on Railroads, Pipelines and Hazardous Materials of the House of Representatives Committee on Transportation and Infrastructure, Chairman Rosenker said that over the past 23 years the NTSB has investigated 16 major railroad accidents in which it established that the probable cause was crewmember fatigue. Operator fatigue has been on the Board's Most Wanted List of Safety Improvements since 1990. In 1999, the Board evaluated the Department of Transportation's actions on fatigue and found that, although DOT supported research and educational programs, the problem continued to be widespread and presented an unnecessary risk to the traveling public. The FRA is the only DOT modal agency that has hours of service for the employees it regulates set by federal statute. The Federal Hours of Service Act was enacted 100 years ago. Chairman Rosenker called the rules archaic and "not adequate to address the problem." They allow railroad operating employees to work 11 hours and 59 minutes, and return to work after only 8 hours off duty. However, if the employee works one more minute - a full 12 hours - the worker is required to have 10 hours off duty before returning to work. Rosenker said "workers are permitted to repeat that arduous work-rest cycle an unlimited number of times." 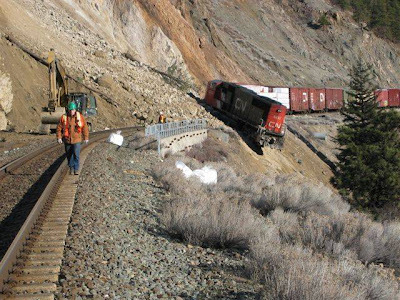 Fatigue related railroad accidents continue to occur, the latest of which documented by the NTSB was in Macdona, Texas in 2004. "The FRA needs authority to regulate crewmember work scheduling practices and work limits," Chairman Rosenker said. "The Safety Board continues to support the need for change that would provide the FRA the authority." NS 212 @ 8:40-with autoracks and COFCs in tow, motive power was NS 8999 (C40-9W), NS 6616 (SD60) and PRR 8325 (C40-8W, ex-CR 6069). NS 24Z @ 8:50-Motive power was two SD70M-2s, NS 2753 and NS 2756. NS 24V 10:20-Motive power was PRR 8323 (C40-8W, ex-CR 6065) and NS 9568 (C40-9W). CSX K277 @ 10:54-after waiting for a track car to come north on the Trenton Line, K277 was cleared to continue its journey. Motive power had CSX 5834 (B36-7) on the point, CSX 672 (AC60CW) and CSX 8866 (SD40-2) taking the garbage south for disposal. 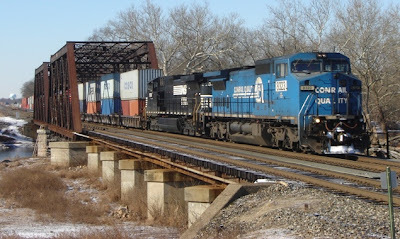 NS 18G @ 11:10-NS 8366 (C40-8W, ex-CR 6137) and NS 2702 (SD70M-2) bringing this general merchandise train east. Waiting on the passing siding was NS 213. This train's power was NS 7102 (GP60), NS 3539 (B32-8), NS 7146 (GP60) and NS 7110 (GP60). With the thermos of hot coffee nearly empty, time for me to call it a morning. This is old news (early January), but you may not have seen these pictures. 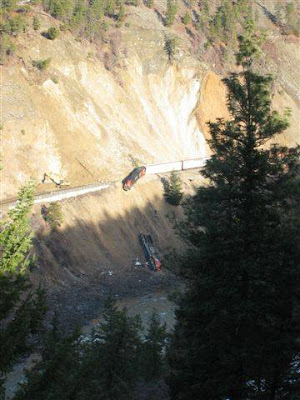 BC derailment at Mile 97.5 (near Lytton) on the Ashcroft Subdivision on January 04, 2007. Crew was rescued the next morning as they were unable to climb the embankment. Only minor injuries reported. Certainly a case of simple dumb luck that there were no serious injuries, or worse. Received the following by email concerning a UP MOW track crane and a bridge over the Columbia River. The kndu link is a TV news item with night time video that is hard to make out. The 2 links to tri-cityhearld are newspaper reports. The yahoo links are only good if you have a Yahoo account. There was another bridge vs. vehicle incident this week up here in WA. This time it involved a UP MOW Track crane crossing over the Columbia River! The center draw-bridge span reportedly started to raise as the driver was crossing the river from Burbank to Finley, WA. Received the following by email. The profit seems high in relation to the sales, but read the whole posting. January 17, 2007-On January 16, 2007, Lionel filed its monthly operating report with the bankruptcy court. It is required to file a monthly operating report since it is in bankruptcy. The report was affirmed to by its Chief Financial Officer, Scott Turkington. December’s numbers were obtained directly from its profit and loss summary filed with court. The interesting thing about December’s numbers is that it allows us to see how Lionel did as a company for the calendar year 2006, rather than just a monthly snapshot, which I have reported on in the past. For the calendar year 2006, Lionel’s gross sales were $62,153,000, and its net sales were $59, 301,000. This is an increase when compared to calendar year 2005, when its yearly gross and net sales were $56,652,000 and $54,850,000 respectively. These figures represent increases in gross sales of $5.5 million, and $4.4 million in net sales between the two calendar years. December 2006's gross sales were over $6.8 million, and its net sales were over $6.1 million. Lionel’s best month in 2006 was November, where its gross and net sales were $11.4 million and over $11 million, respectively. Part of Lionel CEO Jerry Calabrese’s business plan, is to sell a diversified line of Lionel products in more mainstream stores such as Macy’s and Target, in addition to the hobby store market (the funnel theory). This plan is having a positive effect on the company’s sales, based on the increases from 2005 to 2006.Perhaps the most interesting thing about Lionel’s December 2006 report is the monthly profit stated in it. For the month of December, Lionel posted a profit, or net income of $36,111,000. That figure is correct, over $36 million dollars. By contrast, Lionel posted a profit of $2.8 million in November, $1.1 million dollar profit in October, $1.6 million in September and $460,000 in August. Between January and July 2006, Lionel posted monthly losses, but that is to be expected, at least in part, since its business is seasonal. For the year, Lionel posted a profit of $36,871,000. Some may be thinking that the yearly profit (net income) seems very high in relation to the gross and net sales figures. Also unusual is that through the end of November, only one month earlier, Lionel’s year to date profit was $760,000 (the difference between the $36,871,000 yearly profit figure and December figure of $36,111,000). The answer lies in the appeals court decision of December 14, 2006, where it vacated MTH’s $38.6 million dollar jury verdict in its trade secrets lawsuit against Lionel (the total judgment was $40.7 million, but the remaining $2.1 million was against the other two defendants, including Korea Brass). Up to and including November 2006’s monthly report, Lionel’s balance sheet carried a “litigation reserve” amount of $38.6 million on it. In December’s statement, that amount was reduced to zero, due to the court’s decision.